An 18-karat gold rococo bracelet circa 1835 depicting an angel at play amid delicate scrolling garlands. How many times have you overheard the phrase, “I don’t know much about art, but I know what I like?” Art, like beauty, is in the eye of the beholder, and if you take a look around, it’s everywhere. If artwork displayed in museums and chi-chi sculpture gardens, is too intimidating, consider a mini version on a smaller scale in some fine examples of wearable art. The possibilities are numerous and rooted in romance. In the 16th, 17th, and 18th centuries, during the age of arranged marriage between nobles from all over Europe and well before the inventions of photography, Skype, or Facebook, think how useful it would have been to carry a small visual representation of a potential spouse or faraway beloved. A bit of conspiratorial and inspirational artistic license could prove surprisingly pleasant or disappointing after meeting the actual subject in the flesh. Often no larger than a few inches tall by a few inches wide, miniature polychrome enamelled portraits ‚Äì commonly in the form of brooches, bracelets, and pendant necklaces-comprised a fusion of coloured glass. Placing a powdered form of glass particles onto a metal backing plate usually made from silver and gold produced an opaque picture. Depending on price and quality, ivory, copper, aluminum, or porcelain was also used, as in Limoges enamel or vitreous enamel. Successive firings in the extreme heat of a kiln were required for each individual colour in what was a time-consuming process. Painters who worked in miniature received commissions from patrons of the arts, lords and ladies, dukes and their duchesses, or oft-times, mistresses. An exquisite example of polychrome enamel on metal is the suite of ‚ÄòSwiss Misses‚Äô representing various regions called cantons, each in vibrant costumes. The multiple hues of the gemstones add to the overall complexity of the parure. 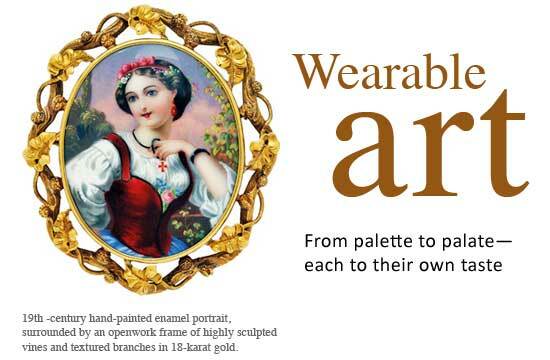 The theme reoccurs in a series of oversized brooches, also from the mid-19th century, each set within a different elaborate frame of 18-karat gold. Angels and cherubs were also popular rococo subjects and less often from the traditional school of formal landscape painting; pastoral scenes were immortalized to colourful effect. More commonly the visage of a lady ‚Äì usually a young maiden mostly in profile or silhouette as in a bust, or allegorical figures with their mythological attributes‚Äîwere portrayed especially during the Victorian era in the quintessential oval shape. An enamel portrait miniature and diamond necklace suspended from a tapering line of collet-set old European-cut diamonds. 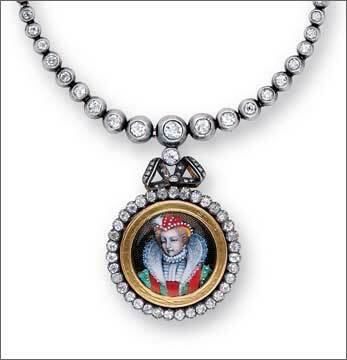 The pendant features a hand-painted portrait of a costumed Elizabethan aristocratic lady. Circa 1885. The most mundane chore could be enlivened when even a receptacle, called an etui, containing the lady of the house‚Äôs needles was embellished with a lively montage of beautiful scenery and ladies. Bricks-and-mortar museums and art galleries have their place in the artistic pantheon, but art can be found everywhere. On the body, it is worn on a scale designed to complement and not overwhelm. You can present options to your customers or patrons consisting of an artist‚Äôs palette of choice and colour. Artistic merit meets portability in the ornate ornamentation of polychrome enamelling.